2017-18 Championship winners Wolverhampton Wanderers have completed the signing of Portugal International Joao Moutinho in a £5 million deal from AS Monaco, it has been confirmed. The 31-year-old signs a two-year contract at Molineux and is the latest part of the Portuguese movement in the West Midlands. With the help of super-agent Jorge Mendes, Wolves are bringing in several top Portugal internationals. Last season Ruben Neves was one of the stars in the second tier following his move from FC Porto. 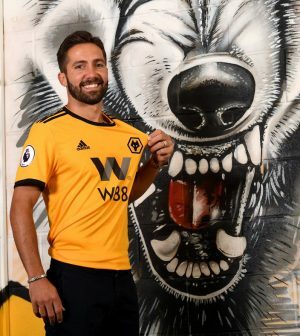 Joao Moutinho becomes the fifth permanent Portuguese signing at Wolves this summer, following Rui Patricio, Diogo Jota, Ruben Vinagre and Paulo Alves. The £5 million transfer fee can certainly be considered a bargain considering the midfielder has been very highly-rated for years and linked to a number of top clubs previously, before spending the past five seasons in Monaco after leaving FC Porto. Only Cristiano Ronaldo (154) and Luis Figo (127) have collected more caps for the Portuguese national team than Wolves’ latest signing (113). Moutinho was part of the Portugal side that won Euro 2016. The Sporting Club of Lisbon youth product went on to win the Portuguese Primeira Liga three times with rivals FC Porto, as well as the 2011 UEFA Europa League. Following a £21.5 million move to AS Monaco in 2013, he went on to score 11 goals in 211 games and help the club surprising win the Ligue 1 title in 2017. There are still more than two weeks left of the summer transfer window and it wouldn’t be a surprise if Wolves landed more players this summer, particularly of Portuguese nationality. Manager Nuno has certainly won the trust of the board following their dominating performance in the Championship last season. As a result of both their performance last season and their summer spending, Wolves are as short as 11/10 to finish in the top half of the 2018-19 Premier League season, immediately following their promotion. Those interested in placing a bet may want to consider a 10bet welcome bonus to help cover the bet. Other bookmakers are available! On top of the aforementioned Portuguese stars that have arrived at Molineux this summer, Wolves have also spent £10 milllion on French centre-back Willy Boly from FC Porto, and the same price in bringing Benik Afobe to the club from Bournemouth. The 25-year-old scored six goals in 16 league appearances during a loan spell during the second half of last season. Afobe previously played for Wolves between 2014-16. Brazilian forward Leo Bonatini has also joined the club on a free transfer. The 24-year-old previously played under Nuno at Estorial, whilst Raul Jimenez has joined on a season-long loan from Benfica.